Around the world, rural women are a major provider of food and food security. The Food and Agriculture Organization of the United Nations argues that improving women’s access to productive resources (such as land) could increase agricultural output by as much as 2.5% to 4%. At the same time, women would produce 20-30% more food, and their families would enjoy better health, nutrition, and education. 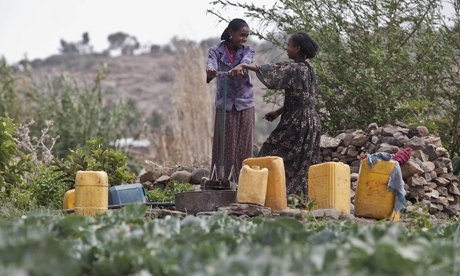 But women in rural areas often face both formal and informal barriers to accessing and owning land. Today, only 30% of land rights are registered or recorded worldwide, and women are the least secure in their access to land rights, with major gaps existing between law and practice in many developing countries. For instance, even when formal law provides that inheritance will be equally divided among heirs, customs might require women to give up their inheritance in favor of male relatives. More generally, women’s access to productive resources is often related to their family relations, notably in the context of marriage and inheritance. Even where gender equitable laws and policies exist, they may not be fully implemented, which can render them meaningless, and to formalize and document land rights for women around the world. The Sustainable Development Goals are also calling for greater access and land rights for women – both Goals 1.4.2 for ending poverty and Goal 5a for gender equality encourage improved access to and rights over land for women. While we at the World Bank and other international organizations work to support rural women to gain access to land and improve their livelihoods, rural women themselves are also working towards this goal within their communities. Often with support from local NGOs, rural women are implementing their own programs worldwide – built on their own social capital, energy, and desire for a better life for themselves and their families. For example, in Brazil’s Pernambuco state, Espacio Feminista is supporting local grassroots organizations and women themselves to be informed about, and to enforce, their land rights. They are bringing together women activists and local officials to understand and respond to the issues around women’s land rights. In Africa, organizations like Groots Kenya are also supporting grassroots women as they seek to understand and better enforce their land rights. Also in Africa, the Kilimanjaro Initiative – an idea conceived by rural women and supported by civil society organizations in 2012 – supports African women to claim rights to access and control over land and natural resources. How can we take these examples from the grassroots and better support and scale them? That is a challenge that many of us in multilateral institutions are facing. We know that some of the things that work in land projects to support women’s land rights include involving women themselves in the discussion, understanding their constraints, and designing ways to respond. We all – multilaterals, donors, governments, and others – need to provide more support to women in their struggle for women’s land rights to close the gap and make land rights for women a reality. On this International Day of Rural Women, help us by sharing your examples and stories here and tell us how we can better support you. This piece was originally posted on the World Bank website and can be found here.